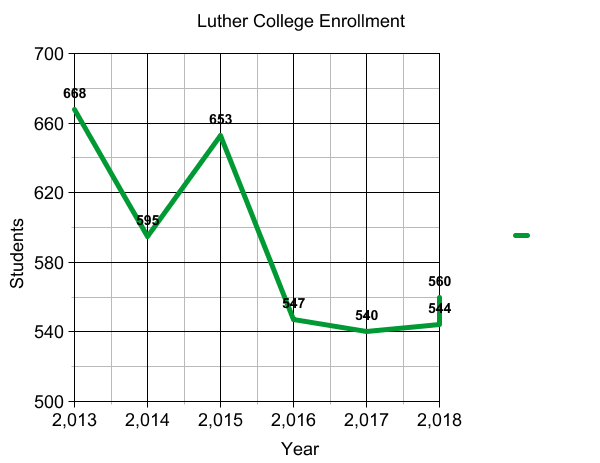 Luther's enrollment rate over the last six years including the projected number for 2018. As of May 4, 544 incoming students are enrolled for the 2018-2019 academic year. This number is up from 526 at this time last year and 540 students at the beginning of fall semester. This represents the first increase in enrollment at Luther in several years. According to Vice President for Enrollment Management Scot Schaeffer, this number will grow even more as additional students enroll later in the spring. Schaeffer credits the increase to systemic changes in Luther’s admissions process designed to attract more students. Additionally, Schaeffer noted that tweaks in Luther’s student recruitment strategy have helped draw in prospective students. Admissions worker Bethany Larson (‘19) highlighted the aspects of Luther’s admissions department that she thinks are most influential in attracting new students. While the increase in enrollment this year is good news for administration, Schaeffer added that enrollment remains below ideal levels. A student body of 600 students per class would translate to a total enrollment of 2,400. The current student population is about 400 students shy of that goal. President Paula Carlson stated in an email that there is still work to be done in improving enrollment numbers. According to Schaeffer, the higher education marketplace has changed considerably in the last decade. Schaeffer added that various factors pose challenges specifically to Luther’s enrollment. “Three of the biggest things that are challenges when you’re recruiting students are being a rural school, a small school, and a religiously-affiliated school,” Schaeffer said. “Those three things cut down on the pool that will look at Luther and those are things we’re never going to change. Despite these challenges, Schaeffer is confident that the institution will maintain viability and attract students. “Luther campus visits are up by 13 percent, applications from Iowa, Minnesota, Wisconsin, and California have significantly increased, and international applications are up by six percent,” Carlson said.